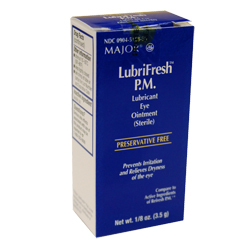 With Artificial Tears sterile eye ointment, your clients will forgo the eye irritation that often results from eyelash or eyeliner procedures. Run a thin bead of this thick gel in the client's eye before any eyeliner or lash enhancement procedures to create a barrier, keeping burning and irritation to a minimum. Clean eye with an irrigation solution after procedure. Numquick Pink topical anesthetic cream relieves local discomfort and pain, keeping clients comfortable and happy. Product is used PRE-PROCEDURE. 15g container yields 15+ applications. From the makers of Tag 45 and NumQuick Pink. PH ballanced for eyeliner use. DotC Blue is topical anesthetic cream for pain. Apply this numbing product PRE-PROCEDURE & MID-PROCEDURE; 15grams.